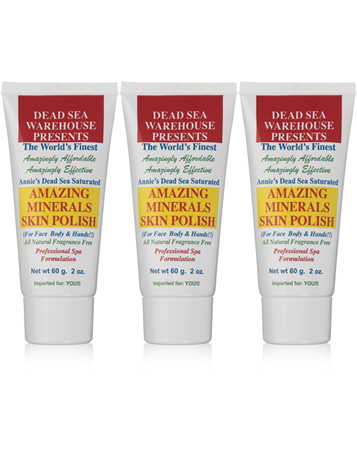 Customer Testimonial: I tried your (Dead Sea Warehouse) Skin Polish and love it! I use it on my face everyday and it has definetly cleared it up. I also use (the Skin Polish) on the back of my arms, after I had a baby they got all dry so I tried the Skin Polish and it works! I also love your (Dead Sea Warehouse) Moisturizer. Works really well on dry feet. I rub it on my 4 year old's feet as well. R.R., Ca.